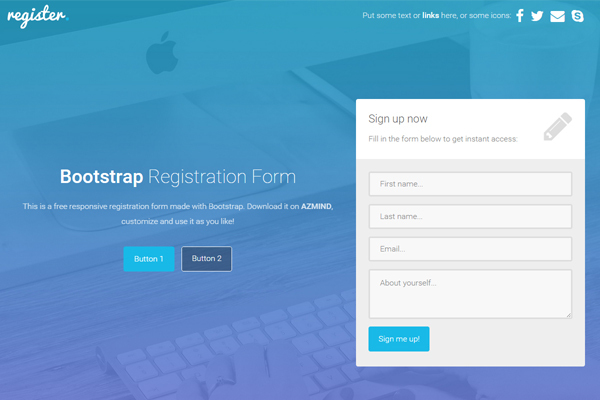 Today’s web design resource is a package of free Bootstrap registration forms containing 3 different responsive form templates to integrate in your projects and use them to collect user data. These templates are very similar to the Marco theme as you’ll see. 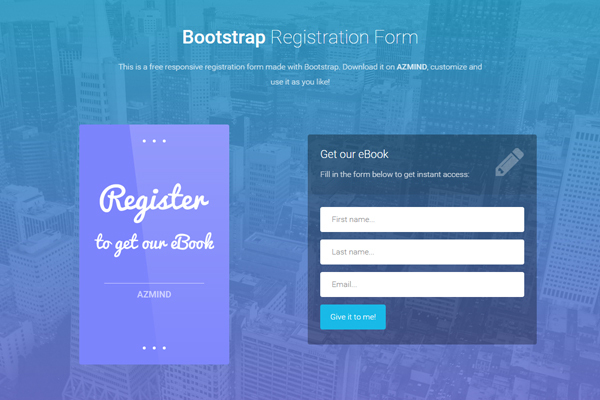 The 3 templates include: a simple registration form with description and call to action buttons, an iPhone mockup (PSD files available) with a registration form, and an eBook mockup with a transparent registration form. 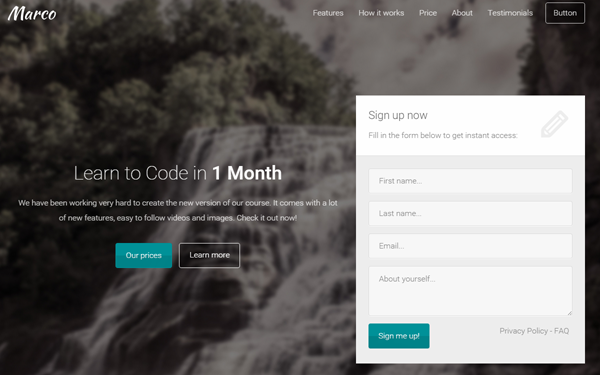 Other features are: fullscreen background (with image slider also available), Font Awesome icons, Retina ready, simple jQuery form validation, etc. Below you’ll find the full list of features, the live preview link and the download link. This is a simple registration form with a description and action buttons. You can change, remove or add new fields to the form and change the description text to tell the user the benefits of signing up. The two action buttons can be used for example, as “Learn more” or “Pricing” buttons. 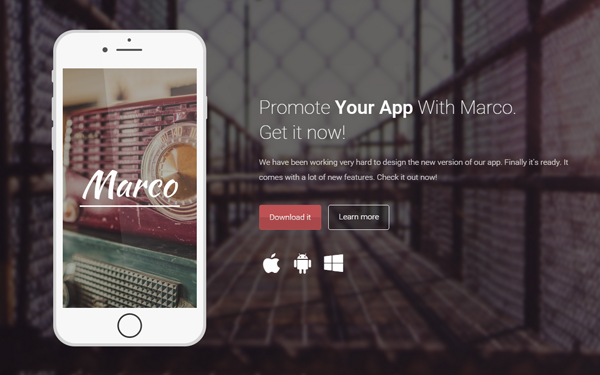 This template can be used for example in an iPhone App landing page. You can use the PSD files to add your own App screenshot in the iPhone mockup. You can use this template for example if you have a free eBook and you want readers to subscribe to download it. You can use these registration form templates in personal and commercial projects, but you can’t sell or distribute them directly, “as is”. If you plan to use them, a link to this page or any form of spreading the word will be much appreciated. Looking for a registration/login form. 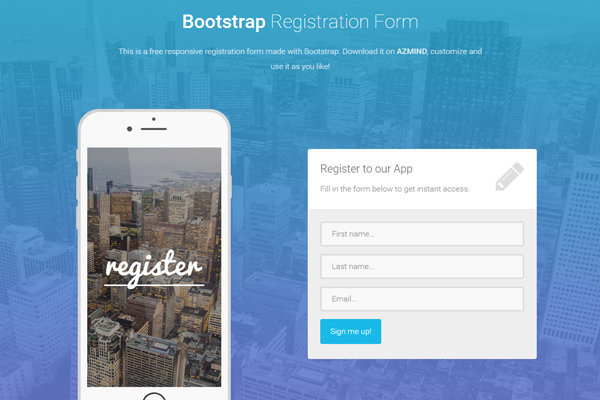 Would be great if you can share a template which has both registration and login in the same page. Great idea! I’ll create it in the next few days 😉 . Thanks for your great template, I Love it. I have a little problem, I’m learning to use html and css and i know that maybe it is so easy to solve. I know mail@domain.com is a example. Hi! I’ve got the same problem, how can I fix this? The two gmail log-ins will take them to a registration form that is already filled in through Google. The 3rd choice will take them to another landing page so they can fill in their own registration info. Our web person is new to bootstrap and I am looking around for some potential templates! Thank you so much for your reply. Ho again! Is there any tutorial to use the form? Thanks! where i can enter the email address where i want to receive the messages? in form 2 plis. Thank you. I am trying to edit the form 1. I was unable to replace ‘register’ at the top with my company name. Please can you show me how I can add checkboxes to the sign up form? I want button 1 to load the sign up form while button 2 displays a pop up of event details which will help the visitor select the event options with checkboxes.